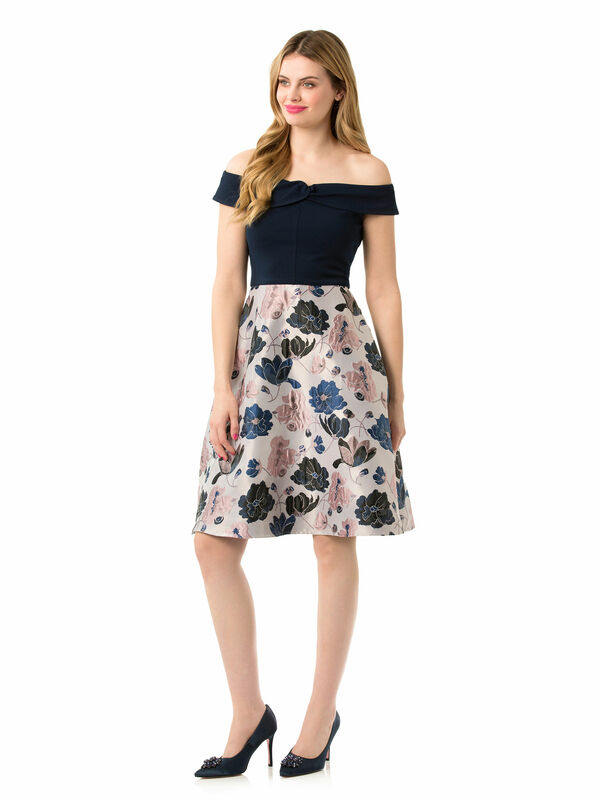 Blue Orchid Dress https://www.review-australia.com/asia/blue-orchid-dress/RE19DR159.RENVY026.html Embrace classic elegance in the stunning Blue Orchid Dress. Beautifully unique, this full skirt dress makes a dramatic impact with its silhouette and texture. The dress has a fitted stretch bodice with a bardot off shoulder structure and twist centre. The skirt is a champagne, blush and navy jacquard stunningly rendered with an orchid print, with a sheen throughout. Embrace classic elegance in the stunning Blue Orchid Dress. Beautifully unique, this full skirt dress makes a dramatic impact with its silhouette and texture. The dress has a fitted stretch bodice with a bardot off shoulder structure and twist centre. The skirt is a champagne, blush and navy jacquard stunningly rendered with an orchid print, with a sheen throughout.